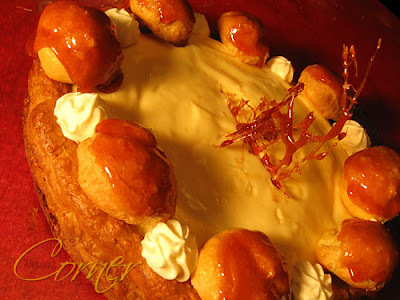 Well of course I did not forget this month's double challenge: Gâteau Saint Honoré. 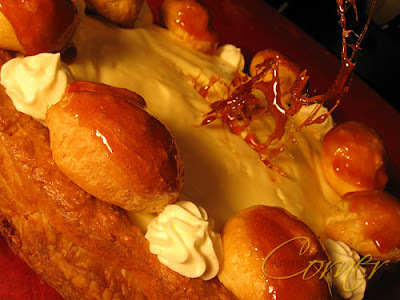 St. Honoré Cake is a cake named for the French patron saint of bakers and pastry chefs, Saint Honoré or Honoratus, bishop of Amiens. I loved making the puff pastry and the cake was so delicious! Sift the flour and set aside. Heat the water, butter and salt to a full rolling boil, so that the fat is not just floating on the top but is dispersed throughout the liquid. Stir the flour into the liquid with a heavy wooden spoon, adding it as fast as it can be absorbed. Avoid adding it all at once or it will form clumps. Cook, stirring constantly and breaking up the lumps if necessary, by pressing them against the side of the pan with the back of the spoon until the mixture comes away from the sides of the pan, about 2-3 minutes. Transfer the dough to a mixer bowl. Let the paste cool slightly so that the eggs will not cook when they are added. You can add and stir the eggs by hand but it requires some serious elbow grease.Mix in the eggs, one at a time, using the paddle attachment on low or medium speed. Do not add all the eggs at once. Check after a few, the dough should have the consistency of thick mayonnaise.Transfer the dough to a piping bag and use as desired. 1/ Make the dough package: In a large mixing bowl, combine both flours with the salt. Scatter butter pieces over the flour mixture; using your fingers or a pastry cutter, incorporate butter until mixture resembles coarse meal. 2/ Form a well in center of mixture, and pour the water into well. Using your hands, gradually draw flour mixture over the water, covering and gathering until mixture is well blended and begins to come together. Gently knead mixture in the bowl just until it comes together to form a dough, about 15 seconds. Pat dough into a rough ball, and turn out onto a piece of plastic wrap. Wrap tightly, and place in refrigerator to chill 1 hour. 3/ Make the butter package: Sprinkle 1/2 tablespoon flour on a sheet of waxed or parchment paper. 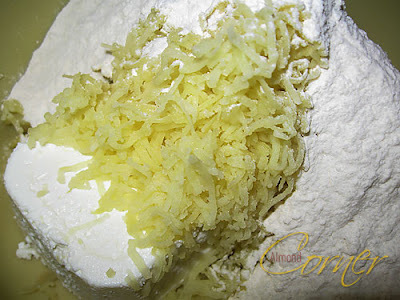 Place uncut sticks of butter on top, and sprinkle with remaining 1/2 tablespoon flour. Top with another sheet of paper; using a rolling pin, pound butter to soften and flatten to about 1/2 inch. Remove top sheet of paper, and fold butter package in half onto itself. Replace top sheet of paper, and pound again until butter is about A inch thick. Repeat process two or three times, or until butter becomes quite pliable. Using your hands, shape butter package into a 6-inch square. Wrap well in plastic wrap, and place in refrigerator until it is chilled but not hardened, no more than 10 minutes. 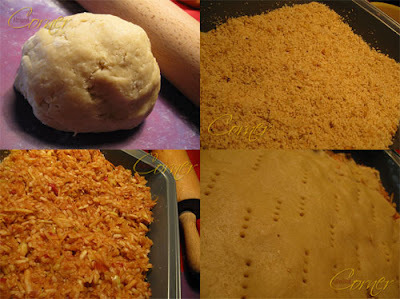 4/ Assemble and roll the dough: Remove dough package from refrigerator, and place on a lightly floured work surface. Using a rolling pin, gently roll dough into a 9-inch round. 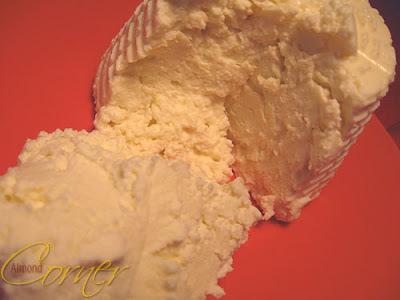 Remove butter package from refrigerator, and place it in the center of the dough round. Using a paring knife or bench scraper, lightly score the dough to outline the butter square; remove butter, and set it aside. 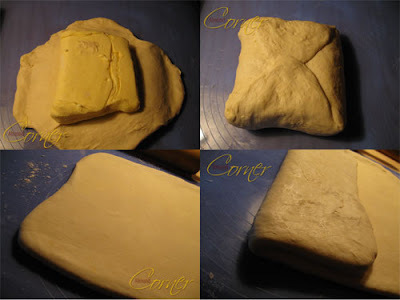 Starting from each side of the center square, gently roll out dough with the rolling pin, forming four flaps, each 4 to 5 inches long; do not touch the raised square in the center of the dough. Replace butter package on the center square. Fold flaps of dough over the butter package so that it is completely enclosed. Press with your hands to seal. 5/ Using the rolling pin, press down on the dough at regular intervals, repeating and covering the entire surface area, until it is about 1 inch thick. Gently roll out the dough into a large rectangle, about 9 by 20 inches, with one of the short sides closest to you. Be careful not to press too hard around the edges, and keep the corners even as you roll out the dough by squaring them with the side of the rolling pin or your hands. Brush off any excess flour. Starting at the near end, fold the rectangle in thirds as you would a business letter; this completes the first single turn.Wrap in plastic wrap; place in refrigerator 45 to 60 minutes. 6/ Remove dough from refrigerator, and repeat process in step 5, giving it five more single turns.Always start with the flap opening on the right as if it were a book. Mark the dough with your knuckle each time you complete a turn to help you keep track. Chill 1 hour between each turn. After the sixth and final turn, wrap dough in plastic wrap; refrigerate at least 4 hours or overnight before using. Soak the gelatin in the 1/4 cup of cold water. Put the sugar, flour, and salt into a saucepan and stir together with a whisk. Add the yolks and enough milk to make a paste. Whisk in the remainder of the milk. Place over low heat and stirring constantly, cook until thick. Remove from heat and stir in the rum and the gelatin. Stir until the gelatin is completely dissolved.Stir in the whipping cream. Set the mixing bowl in cold water and stir until the cream is cool. Place the egg whites in a clean bowl and using clean beaters, whip them with the dash of salt. As soon as the whites begin to stiffen, gradually add the 1/2 cup of sugar and beat until they are very stiff. Fold the egg whites into the cooled cream. Roll the puff pastry out to 1/8 inch (3 mm) thick, 12 inch square (30 cm). Place on a sheet pan lined with parchment paper. Refrigerate covered at least 20 minutes.While the puff pastry is resting, make the pate a choux and place it in a pastry bag with a # 4 (8mm) plain tip. 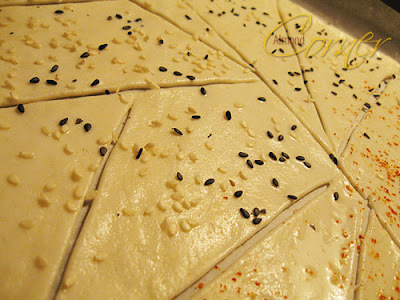 Reserve.Leaving the puff pastry on the sheet pan, cut a 11 inch (27.5 cm) circle from the dough and remove the scraps. (An easy way to cut it is to use a 11inch tart pan as a “cookie cutter”). Prick the circles lightly with a fork. Pipe 4 concentric rings of Pate a Choux on the pastry circle. Pipe out 12 cream puffs the size of Bing cherries onto the paper around the cake. 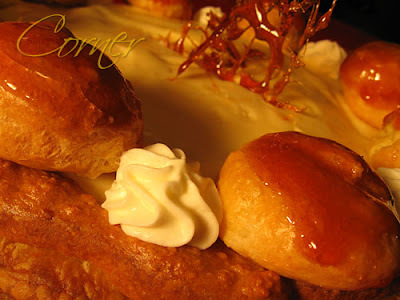 Bake the puff pastry circle and the cream puffs at 400F (205C) until the pate a choux has puffed, about 10 minutes. Reduce the heat to 375F (190C) and bake until everything is dry enough to hold its shape, about 35 minutes longer for the cake and 8 minutes longer for the cream puffs (just pick them up and take them out as they are done)Place about 4 oz (114 gr) of the Saint Honore Cream in a pastry bag with a #2 (4mm) plain tip. Use the pastry bag tip or the tip of a paring knife to make a small hole in the bottom of each cream puff. Pipe the cream into the cream puffs to fill them. Refrigerate. Spread the remaining cream filling on the cake. Refrigerate for at least 2 hours to set the cream. Caramelize the 8 oz. of sugar: Fill a bowl that is large enough to hold the pan used for cooking the sugar with enough cold water to reach halfway up the sides of the pan. Set the bowl aside.Place the sugar in a heavy bottomed pan and cook until the sugar until it has caramelized to just a shade lighter than the desired color. Remove from the heat and immediately place the bottom of the pan in the bowl of cold water to stop the cooking process. 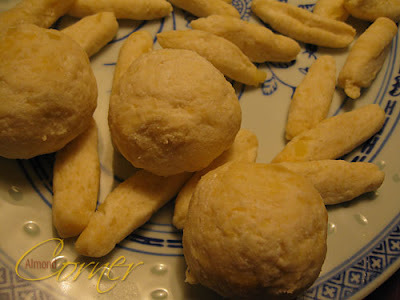 Dip the cream puffs into the hot caramel, using 2 forks or tongues to avoid burning your fingers. Place them on a sheet pan. The caramel must be hot enough to go on in a thin layer. Reheat if necessary as you are dipping, stirring constantly to avoid darkening the caramel any more than necessary. Also, avoid any Saint Honore cream to leak out of the puffs and get mixed in with the caramel while dipping as the cream can cause the sugar to recrystalize.Whip one cup of heavy cream and teaspoon of sugar to stiff peaks. Place the whipped cream in pastry bag fitted with a #5 (10mm) star tip. Pipe a border of whipped cream around the top of the cake. Arrange the cream puffs, evenly spaced, on top of the filling, next to the cream. Normally I bake the actual month's challenge only some days after it is announced, however this time it took me so long to start! Altough it is such a simple and easy recipe. So what am I talking about? 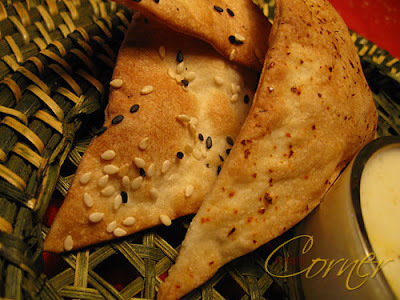 Lavash crackers from The Bread Baker's Apprentice: Mastering The Art of Extraordinary Bread, by Peter Reinhart. 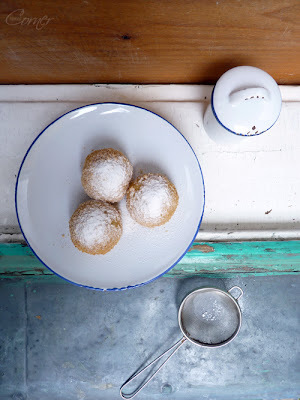 The first ever vegan recipe in the history of the Daring Bakers, hosted by Sheltie Girl of Gluten A Go Go and Shel of Musings from the Fishbowl. I really loved these crackers! 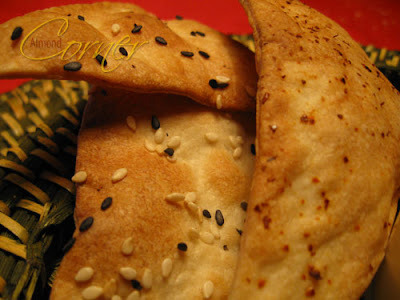 I decorated them with sesame seeds and chilli. As a dip I made a simple yoghurt dip with some orange juice and coriander, nothing special but it was nice to chill the burn of the chilli with it. 2. For Non Gluten Free Cracker Dough: Sprinkle some flour on the counter and transfer the dough to the counter. Knead for about 10 minutes, or until the ingredients are evenly distributed. Lightly oil a bowl and transfer the dough to the bowl, rolling it around to coat it with oil. Cover the bowl with plastic wrap. 3. Ferment at room temperature for 90 minutes, or until the dough doubles in size. 4. For Non Gluten Free Cracker Dough: Mist the counter lightly with spray oil and transfer the dough to the counter. Press the dough into a square with your hand and dust the top of the dough lightly with flour. Roll it out with a rolling pin into a paper thin sheet about 15 inches by 12 inches. You may have to stop from time to time so that the gluten can relax. At these times, lift the dough from the counter and wave it a little, and then lay it back down. Cover it with a towel or plastic wrap while it relaxes. When it is the desired thinness, let the dough relax for 5 minutes. Line a sheet pan with baking parchment. Carefully lift the sheet of dough and lay it on the parchment. 5. Preheat the oven to 350 degrees Fahrenheit with the oven rack on the middle shelf. 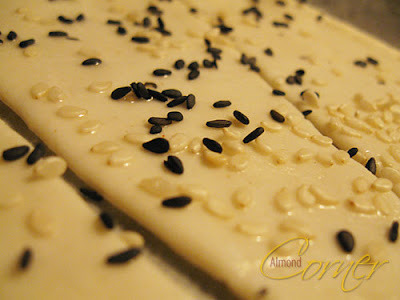 Mist the top of the dough with water and sprinkle a covering of seeds or spices on the dough. If you want to precut the cracker, use a pizza cutter (rolling blade) and cut diamonds or rectangles in the dough. You do not need to separate the pieces, as they will snap apart after baking. If you want to make shards, bake the sheet of dough without cutting it first. Poppy, deep black grated poppy seeds. 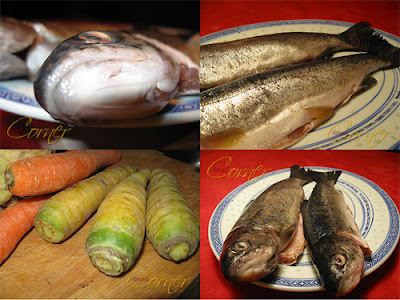 I wanted to inculde them in today's lunch and combine with white polenta. I want to cook since long a black and white dish, but so far I have not found it, also not today. Anyway this dish is an insane(?) idea of mine, well some might say it is insane, but it is totally delicious! To me poppy needs sweetness or something fruity. I found some oranges that inspired me to make orange chicken breats with poppy crust and white polenta with a light rosemary touch and to have something savoury I improvised a pecornio sauce. Next time when I cook this for lunch, the only thing I am going to change is that I spread the crust thinner, because less is more! Half chicken breasts, salt, rub in with cayenne pepper and let is marinate in orange juice for about 30-40 minutes. Fry from both sides in butter and set aside. Mix grated poppy with orange juice, honey, and a pinch of salt and spread it on the breasts. Put some butter on each and let the oven do the rest on 180°C for 20-25 minutes. Cook chicken stock and add polenta, cook for 40 minutes, while stirring constantly on lowest heat with the rosemary twig. Heat butter, add chopped shallot, white wine, stock and let it reduce. Sieve, add pecorino and heavy cream, season with salt and pepper. While checking out my deepfreezer I discovered a package of frozen blackberries and some packages of quark that I brought from Hungary. 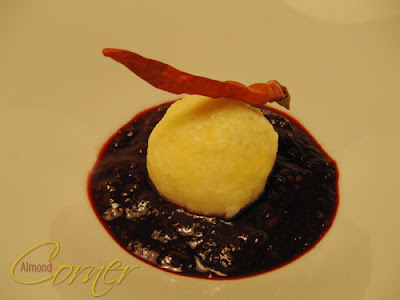 I decied to prepare quark dumplings with blackberry sauce. 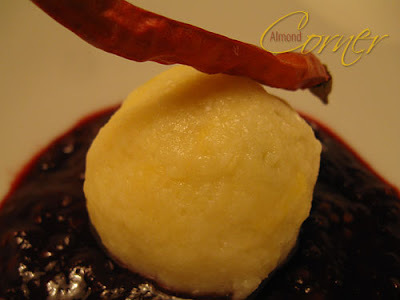 The recipe is sort of a mix of the túrógombóc and the plum dumplings. 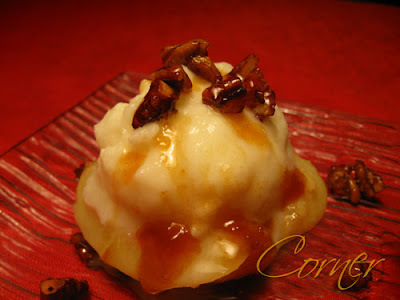 I have never made this dish before, but I think this dumpling has the best consistence of all, even on the next day! Cook potato, peel and grate. Add flour, salt, egg and quark and knead a dough. Form dumplings and put one blackberry in each. 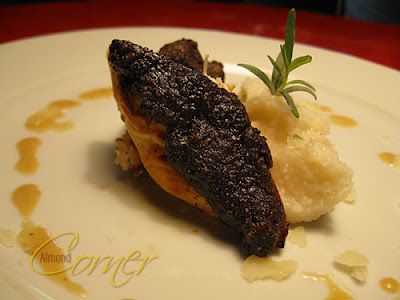 For the sauce bring blackberries, red wine and syrup to cook, let it reduce and puree. 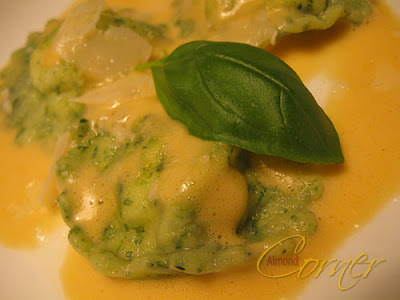 Spinach and ricotta filled ravioli is almost a classical, however I am not a spinach fan at all. That is why I wanted to prepare this pasta dish in in my way. 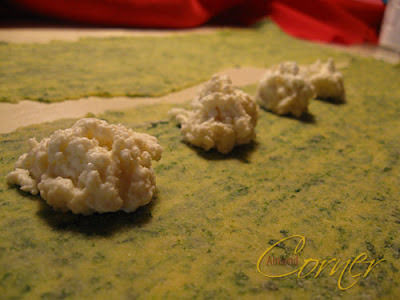 I decided to make spinach pasta and simply fill it with ricotta. I served it on basil-tomato foam and some pecorino. Well this lunch is definetly a dish that I am going to prepare often, it was very tasty and all harmonised great together. 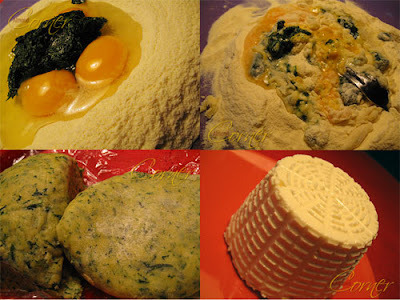 Make a hole in the middle of the flour, add eggs and cooked spinach and whisk all in with a help of a fork. When the dough is getting viscous knead it with your hands until smooth. Set it aside to the fridge for an hour. Mix ricotta with salt, pepper and lemon juice. 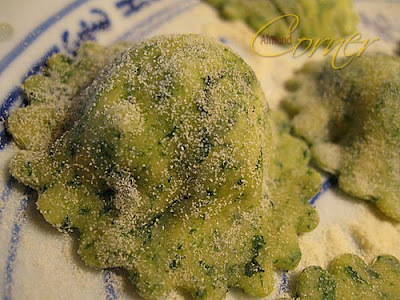 With a help of a pasta machine roll out pasta dough and place a teaspoon of ricotta filling on it and make ravioli with a help of a form or anything you've got. Heat olive oil, add chopped shallot, basil leaves. Pour white wine on it and let it reduce, add tomato juice and stock and let it reduce about half. Sieve liquid and above steam whisk the liquid with the egg yolk and beat it for about 15 minutes until it gets nice and foamy. 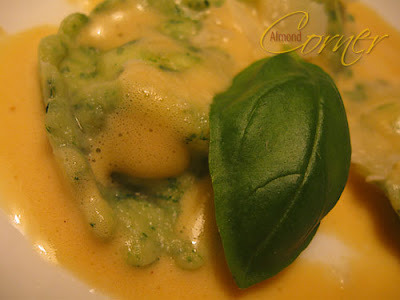 Cook ravioli in salty water and serve with the foam and some pecorino chunks. These days I have been busy preparing medieval meals in my kitchen. Yeah, it is not very authentic to use an oven and some saucepans but what else should I have done, so let's forget this part. 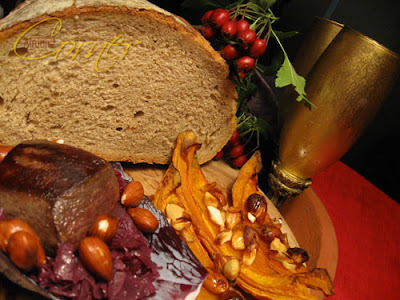 I participate in a medieval cook contest in an online game and I decided to post the dishes also here but together with a let's say modern version. I baked an apple-spice tart, fried trout and prepared my first ever piece of venison. So let me begin with the tart. 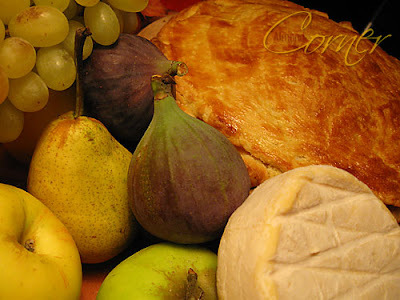 The recipe, that is by Taillevent, a cook in the 14th century known to have written the first cuisine book in French, Le Viandier, ordered by Charles V of France "the wise", calls for onions, dried figs and grape, ginger, anise, cinnamon, saffron and white wine. 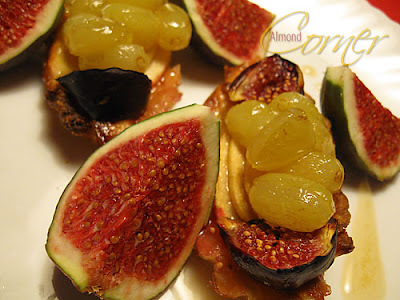 In my modern version I decided to use fresh figs and apple sliced on top of the tart and served with honey-white wine grapes. Knead a dough out of flour, butter, honey and egg and let is stand for 1 hour. Grind spices. 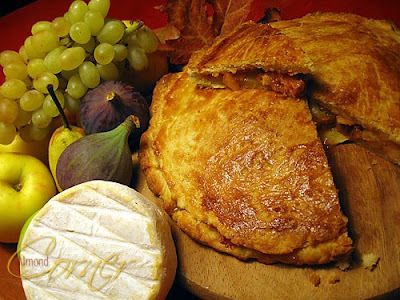 Roll out half of the dough and place filling on it: melt butter and add onions, figs, sliced apple and grape, spices, add wine and let it reduce. Cover it with the other half of the dough, brush with egg and bake for 15 minutes on 200°C. 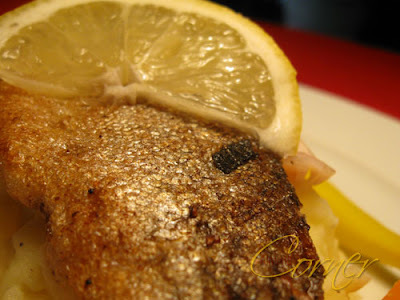 The trout recipe is really simple: salt fish, mix thyme, sage and mint leaves with butter and smear it on the fish, place a rosemary twig into it and grill for 4-5 minutes per side. The modern version I served with some simple potato-celery mash flavoured with lemon juice. I was very excited about this dish because I haven't eaten wild before, except the bison, that was fabulous. Now I found out that venison is not my cup of tea. 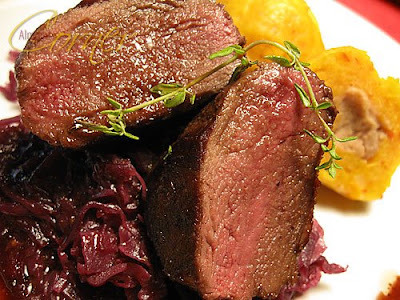 Here in Switzerland, if you eat wild you usually get red cabbage, chestnut and potato dumplings served with it. For the medieval part I would have loved to have a whole haunch of venison, but that would have been too much anyway. 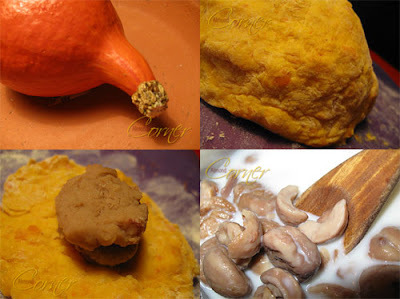 I decided to prepare pumpkin dumplings filled with chestnut puree, that I prepared those myself using canned chestnuts as I could not get any fresh ones, and red cabbage, flavoured with cinnamon, clove, bay leaf, orange juice, coriander, red wine and red wine vinegar. For the medieval part I baked pumpkin with honey and almonds, as almonds were common and they drank almond milk instead of cow milk that time. For dessert today I decided to combine white chocolate and lavender. As first I wanted to make white chocolate-lavender ice cream, but than I had another idea: in sherry-lavender syrup poached peach with white chocolate sorbet and caramelised pecans. I reduced the sherry-lavender mixture together with some apricot preserve to have a sauce. Mmm a light and delicious dessert! I submit this dessert to the Culinarty Roundup a monthly event created by Lore! Bring water and sugar to boil, add chopped white chocolate and cook for 2-3 minutes while stirring constantly. Set aside and let it cool, after let the ice cream machine do the job. Peel and half peach. Bring sherry with lavender syrup to boil and let peach stew in it for 5-10 minutes. Reduce sherry mixture with apricot jam until you get a thick sauce. 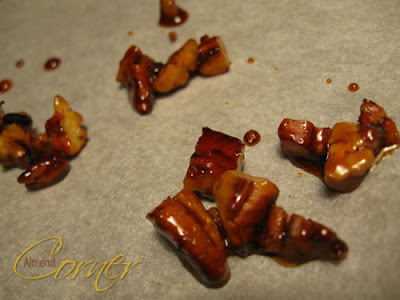 Melt sugar, add chopped pecans and cover with caramel, let it cool a baking sheet. Surprise after surprise! The first: I am the winner of the Art You Eat #4 event, so that means that I had to choose the theme for the next one. Here it is: create an Autumn inspired dish using seasonal ingredients and/or colors. More details you find here. 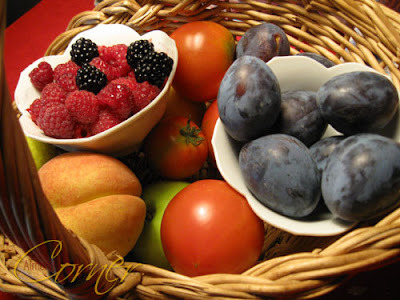 The second surprise: yesterday afternoon a small basket was waiting for me in front of my door full of wonderful fruits! I decided to use the tomatoes in today's lunch, I just had no clear idea about it. 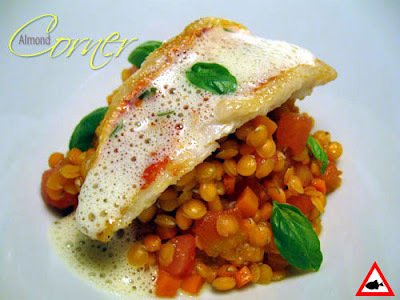 I remembered that I have heared somewhere that red mullet and tomatoes are a great match. 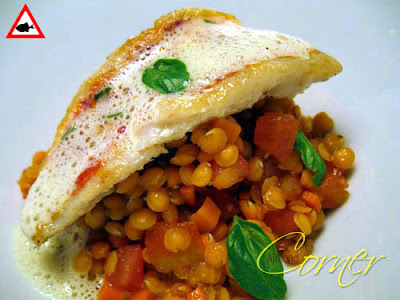 I decided to prepare a lukewarm red lentil-tomato salad with the fish. I thought a dijon mustard foam would go pretty well with it. So that is how this improvised lunch was born today. Cook lentil in stock for about 25-30 minutes together with chopped carrot. Peel tomatoes and slice in cubes. Mix grapeseed oil, sherry vinegar, salt, pepper and tomato cubes with the cooked lentil and set aside. Heat a small saucepan, add 1 tablespoon butter, chopped shallot, fish stock, heavy cream, white wine and reduce. Add mustard and 1 more tabelspoon butter and lemon juice. With a help of a mixer whisk so that it gets foamy. 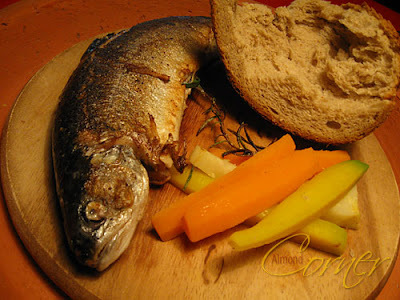 Fry mullet in olive oil and serve on top of the lukewarm salad. Garnish with basil leaves. 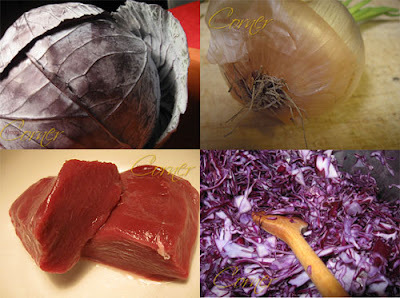 Last week I did not have a single minute to cook, altough I spent more than 40 hours in the kitchen, but not in my own! I had the opportunity to be in a restaurant kitchen and I really enjoyed it! Unfortunatly I had no chance to take photos, because I have been busy working there. I am a lot inspired by those beautiful dishes that had been prepared there! Once for dessert there were plum bars that made me remember of my mom's apple bars, altough they are not quite the same. 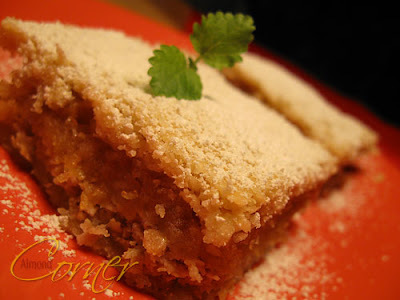 Anyway I always loved these bars that she used to prepare when I was a child. Of course I wanted to have her recipe so I asked for it yesterday and baked immediately. Knead a dough out of flour, butter, sour cream, powder sugar and salt. Half dough, roll out and place it into a buttered form. 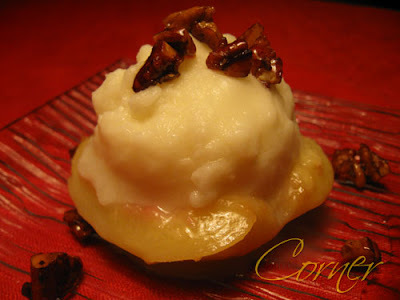 Coarsly great apple and set aside. 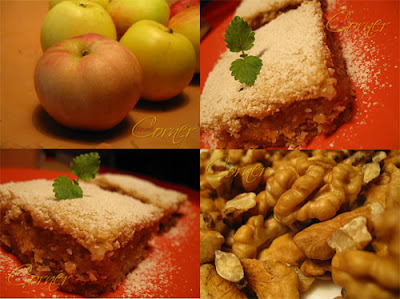 Sprinkle grated walnut and half of the sugar-cinnamon mixture on the dough. Squeeze out apple and add on top of the walnut, sprinkle with the rest of the sugar-cinnamon mixture and cover with the other piece of rolled out dough. Make holes with a help of a fork. Bake for 20-25 minutes on 180°C. I believe there are dishes that should be prepared the way our grandmothers and their grandmothers did. I consider plum dumplings such a dish. 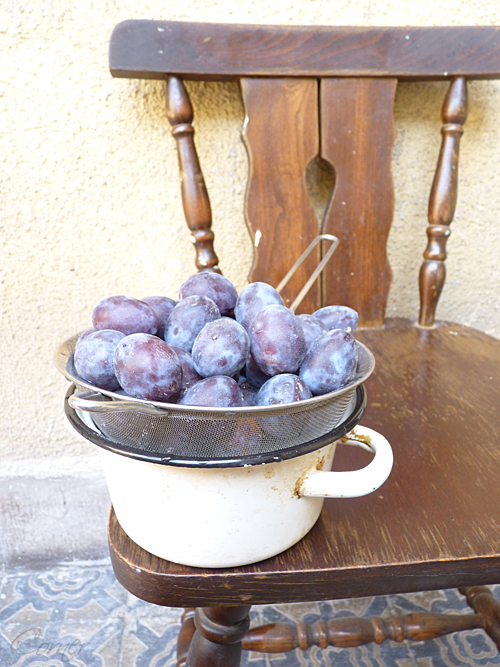 As a child I never ate the plum, only the rest with loads of sugar. 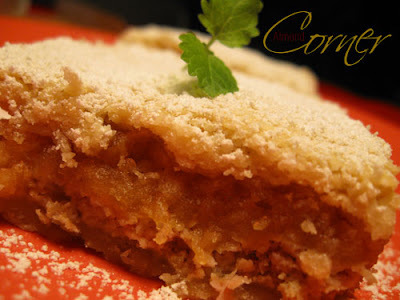 In no way I wanted to eat it with breadcrumbs, so I always asked for grated nuts or coconut, however meanwhile I am sure it is the best way to eat with the breadcrumbs! Of course it is decorative if you use white coconut flakes and black poppy seeds to coat the dumplings, but believe me, nothing can beat the original, I have tried them all! So let us stick to the tradition in this post and use the breadcrumbs. 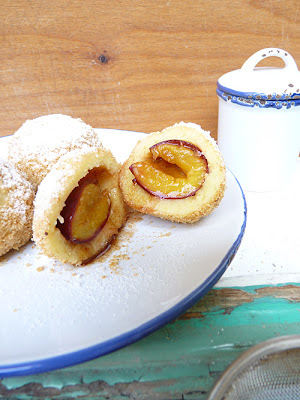 Unfortunately the plums I used are absolutely not the right ones for dumplings, but I just could not resist the thought of the juicy cinnamon and the plump potato dough sprinkled with loads of cinnamon sugar. So if you plan to prepare this dish look for the small purple plums! Cook potatoes until soft. Drain and peel. 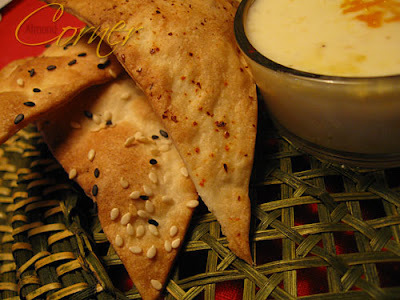 Mash potatoes and add sifted flour, salt, semolina, egg, oil. Knead gently till all is blended. On a floured surface, roll dough out, not ticker than a finger.Cut dough into squares and put a with sugar and cinnamon filled plum into center of each square.Fold corners to the middle and roll the dumpling in your hands till round.Cook a few dumplings at a time in salted water for about 10 minutes until they swim on top.Place in a pan in which bread crumbs have been toasted in butter or oil. Serve warm with cinnamon powder sugar.